Last week, I had a chance to hang out with my college friend again after such a long long time. 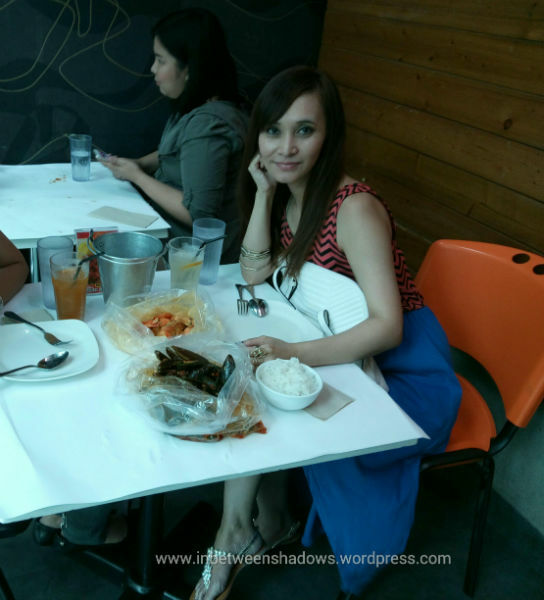 I don’t always get to go out so I am not as updated as I want to be when it comes to popular restaurants around the Metro. My friend and I decided to meet halfway and so our location of choice was Taguig. 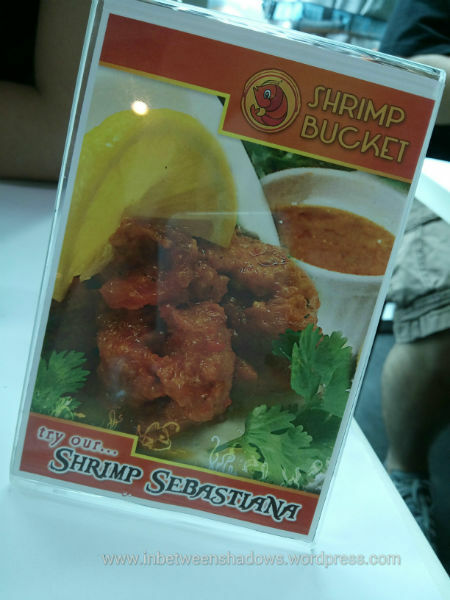 She suggested that we eat at “The Shrimp Bucket” to which I agreed. 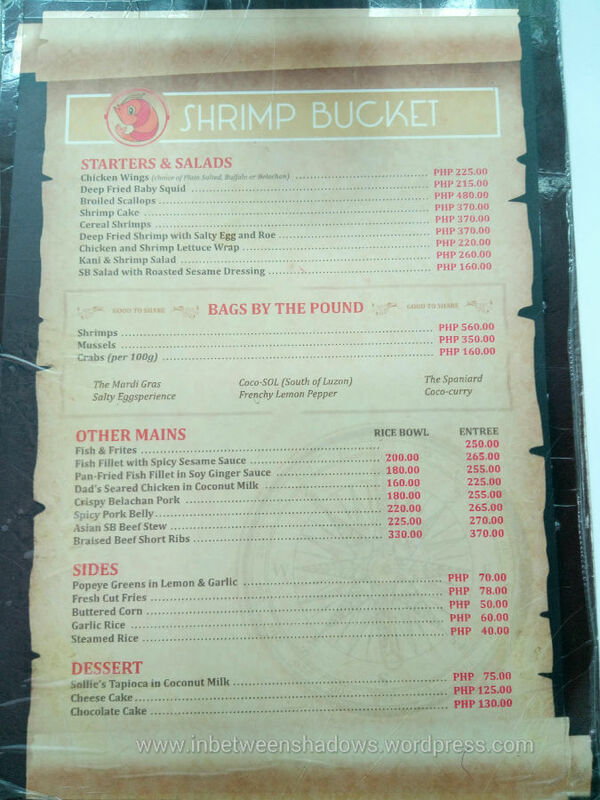 The Shrimp Bucket is located at the ground floor of Grand Hamptons Building Tower 1, 2nd Avenue corner 31st street, Fort Bonifacio. I don’t remember if there are any parking spaces available in the area but my friend instructed me to park at the parking lot nearest to the Mind Museum. You see, I’m not very good at directions and even with a GPS on hand, I still end up getting lost at times, which is why my friend opted to meet me at the parking lot. Haha! I forgot to take pictures of the restaurant because I was so hungry that time. I would say this though… the restaurant is quite small. They have a 2nd floor but I wasn’t able to see how many tables there were because as soon as we got upstairs, the waitress immediately asked us if we made reservations. When we told her we didn’t call to reserve, she told us to take the table nearest to the restaurant’s entrance door. There are just 2 dining tables (one table good for 2 diners only) near the entrance door and one long table (possibly for a group of 6-8 people) near the kitchen area and that’s about it. They do have several tables located outside the restaurant but the inside was really tight. In fact, my friend had to stand up several times every time someone leaves or enters the restaurant. It was such an inconvenience! Luckily, it was my friend who was seated near the door because she is more patient than I am. Haha! We decided to order 2 dishes under the “Bags By The Pound” category. One order of Shrimps in “Salty Eggsperience” flavor and an order of Mussels in “Mardi Gras” flavor. We chose those flavors because the waiter said that those are their Best Sellers. I was a bit hesitant with the “Salty Eggsperience” at first because I was told that it’s with a mixture of salty eggs, which I do not eat, but my friend said it’s really good so I gave in. The “Mardi Gras” flavor, on the other hand, has Chorizo and Garlic in it. It is also said to be on the spicy side. *Note: When a waitress came and placed our orders on the table, we were surprised to see 2 shrimp dishes in “Mardi Gras” and “Salty Eggsperience” flavors. We told her we ordered Mussels in “Mardi Gras” flavor not Shrimp. She then called the waiter who took our order and he told us “Ma’am, order niyo po ay shrimp, hindi mussels.” He said he did repeat our order and we did approve of it. 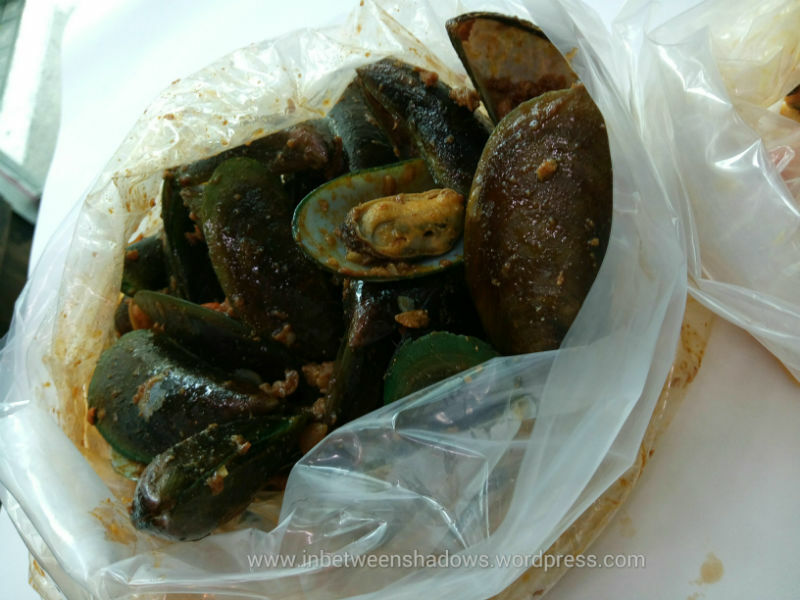 To be honest, we probably missed it when he repeated our order and said Shrimp in “Mardi Gras” flavor but, in our defense, we did mention Mussels (several times) to him when he was answering our queries about the different flavors. I don’t know how he got it wrong but he did replace our order with the correct one. I don’t know if he was pissed about it but when he told us “sige, palitan ko nalang po”, he didn’t look happy. In fact, he was not smiling at all. 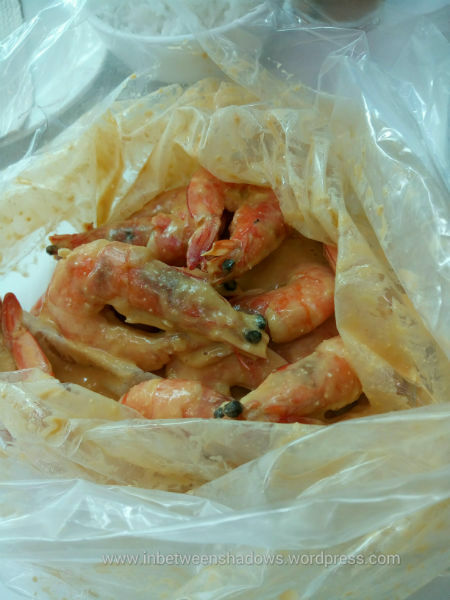 The Shrimp in “Salty Eggsperience” flavor was really tasty. I haven’t really tried salty eggs yet and I’m not even sure if “salty eggs” mean it’s supposed to be saltier than usual but the “Salty Eggsperience” flavor isn’t that salty at all. The taste was creamy. 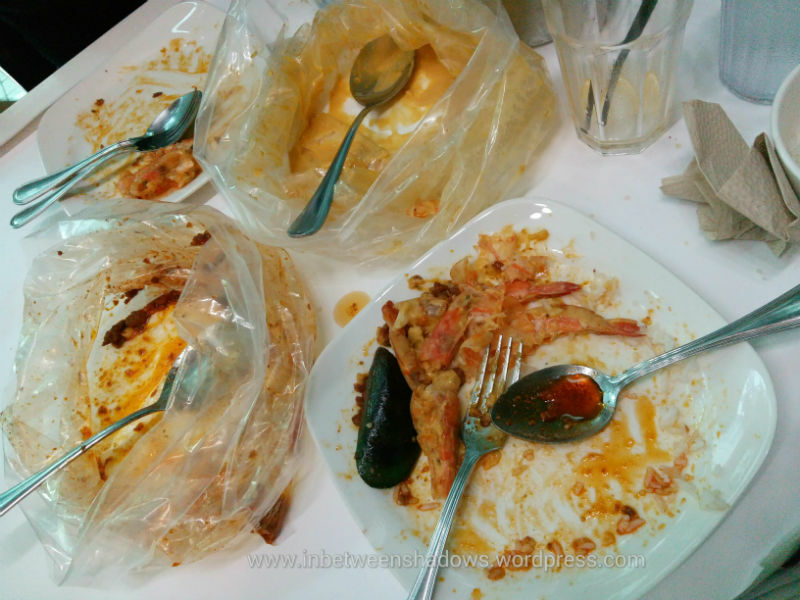 The shrimps were not overcooked and for the price of Php560, I was really delighted to see a lot of huge-enough shrimps inside the bag. The Mussels in “Mardi Gras” flavor was my favorite. It was like an explosion of flavors in my mouth. The taste of Chorizo (together with garlic) was so addicting that I actually ended up eating more mussels than the shrimps. Interestingly though, it didn’t taste spicy to me even if they said it is spicy. I do love eating spicy food so maybe its spice wasn’t that intense for me but I really don’t mind because it was just so damn delicious that I actually had to order another cup of rice. What is great about the “Mardi Gras” flavor is that it can stand alone. Even without the main seafood in it, you would still enjoy eating it since it is packed with flavors. Seriously, that’s how awesome it was! You could tell that I ate more than my friend did. She didn’t even eat rice and I had 2 cups. Lol! If I was at home eating this, I would have put the rice inside the bag so that no amount of sauce will be wasted or left unused. Haha! The lemonade tasted good too. 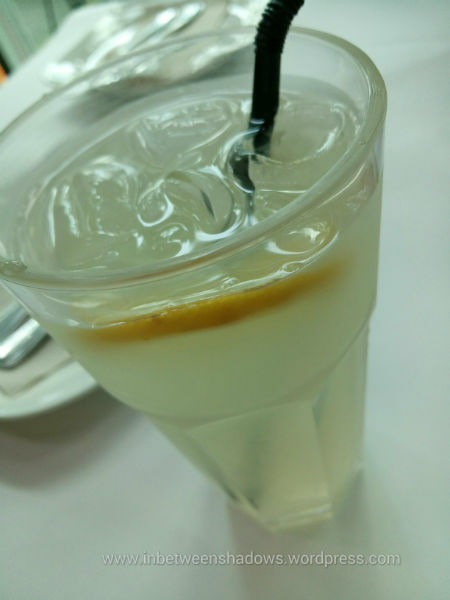 I usually don’t go for lemonades when I eat out but they don’t serve regular Lemon Iced Teas so I ordered this one instead – They have a Lemon Raspberry Iced Tea but I don’t want Raspberry. This drink costs Php90. 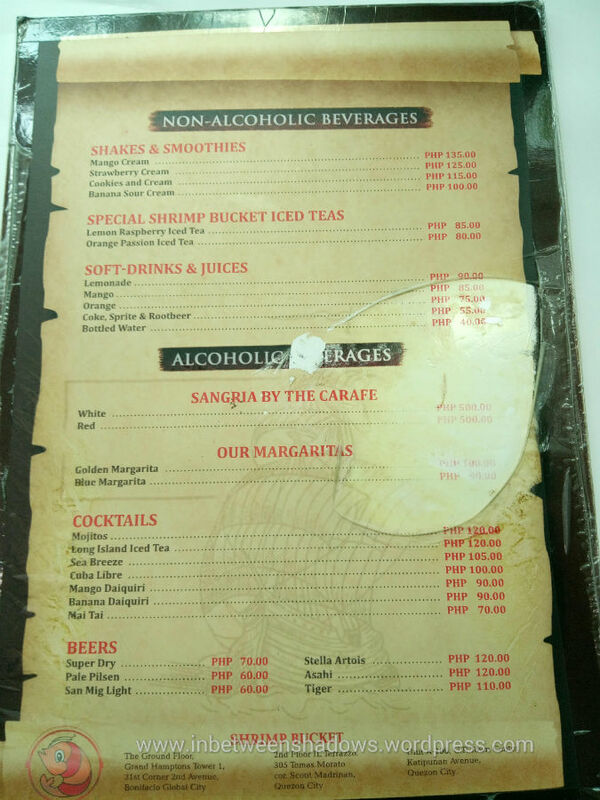 If you want something cheaper, you can go for their sodas priced at Php55 each.